$12 for 4 Super Pads + Free Shipping! Holds Cellphones & More on Car Dash + Other Uses, $30 Value! Right now at DealPulp, you can get 4 Super Pads for just $12 plus free shipping. This set regularly costs $30! Our pads can be used in the car, office and home. This unique surface holds cellphones, sunglasses, spare change and other loose items. 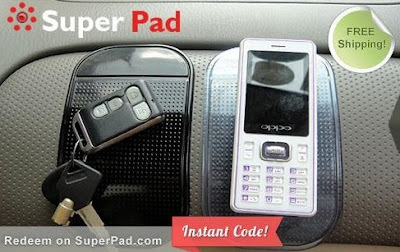 Super Pads stick to smooth surfaces including glass, the dashboard, or center console. This pad can be easily washed and does not leave any residual adhesive. Don't let papers, glasses, or anything else you may keep on your dashboard distract you while driving. When you purchase, you'll get a code that you can instantly redeem on the Super Pad site...no waiting around for a voucher!